Pro Illuminating Tweezer is a visionary tweezing system with an illuminating LED light that allows for perfect, thorough tweezing every time. Crafted from the finest stainless steel, the hand filed tips are perfectly aligned and guaranteed to tweeze. 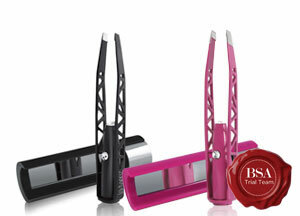 The ultra bright LED light Illuminates your eyebrows and allows you to see those hard to reach hairs. All Tweezers are made with 100% stainless steel and have hand crafted tips so precise, they will ensure absolute success in eyebrow grooming. Perfect for both at home and on the go, the chic compact carrying case has a built in magnifying mirror. Availability: takealot.com, kalahari.com and selected salons. Saddest news of the week, my favourite pair of tweezers went missing. And depression mode just kicked in! But of course as super sweet as my mother is, she got me a surprise present. She bought me a Pro Illuminating Tweezers. The packaging of the product was just so cute I really didn’t want to open the product, until I couldn’t hold the excitement any longer and opened the packaging, the packaging is a hard cardboard mini hand bag which has a magnetic close back so it’s completely reusable. The actual tweezers are simply the cutest tweezers I’ve ever seen, I have a white one. The tweezer has a button which switches an LED light on so grabbing those nasty eyebrow hairs can be a much much quicker action rather than standing for hours. However instead of having an actual button, they replaced it with a Swarovski Crystal which shines like crazy. To make things even easier, the carry case contains a magnifying mirror which helps catch those eyebrow hairs even when there’s no mirror around! Plus the carry case is so small and convenient that it can fit almost anywhere! The tips of the tweezer are slanted which are perfect for catching those pesky hairs which are either too fine or too stubborn. I would recommend this product to anyone who is as blind as I am when it comes to tweezing and needs a light which will make everything easier. It retails at R150. And I know you probably thinking its a lot to spend but I feel it’s worth it because they are long lasting and won’t really give up because my cousin has one for quite a few years now. Plus they super cute and it’s okay for a splurge! Or even a gift for someone. This looks like a really cool invention! Good job! This looks like the perfect product for me. I always struggle with my tweezer ,not pinching the air or finding light to see clearly. Will buy one for sure. I have bad eyesight so most of the time I feel pretty blind while tweezing. I am often tempted to put my specs on but where is the practicality in that? Whoever thought of inventing this thing is a GENIUS. It looks and sounds amazing. Definitely worth the price! This is the first I heard of this. I have very small hairs on my eyebrows that no amount of positioning and lighting manages to get all of them. I would love to get my hands on one. Where can I purchase one and how much is it?